In their latest email blast from February 2, 2016, the Northwest Jobs Alliance (NWJA) is still telling tall tales and taking things out of context about what Lummi Nation leadership and others in our community are saying about Cherry Point Industry. In the opening paragraph of their email, regarding the recent Public Hearing on the Whatcom County Comprehensive Plan, NWJA asserted, “ the Council chambers overflowed with supporters of job retention and creation who pushed back on the efforts of extreme environmentalists and the current leadership of the Lummi Nation to downzone and deindustrialize the Cherry Point heavy industry zone.” (emphasis theirs). Therefore, I am posting a link to the video of the Whatcom County Council Public Hearing on the Whatcom County Comprehensive Plan, held last Tuesday, January 26, so the truth is handy for whoever needs it. At the links provided for each name, you can play back what some of the parties listed and targeted in this latest smear piece by NWJA actually did say about the industries at Cherry Point at the hearing, and get an idea of what their vision is for Whatcom County: Kirk Vinish, Interim Director for Lummi Planning and Public Works, speaks at about 2:33:07; Matt Petryni, Clean Energy Program Manager at RE Sources for Sustainable Communities speaks at 4:06:20; and Sandy Robson speaks at approximately 3:11:06. 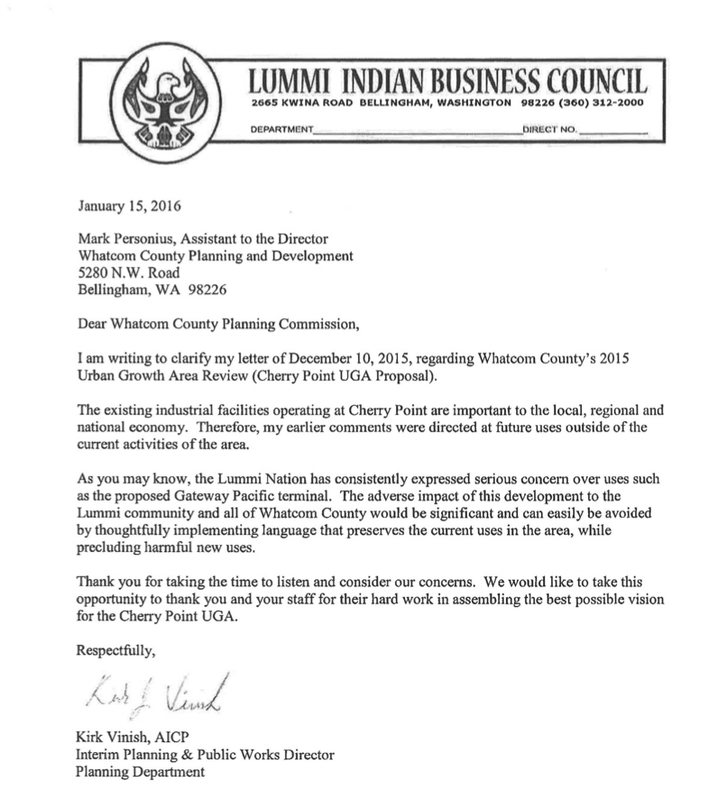 There is not one mention by Vinish, representing Lummi Nation, or Petryni representing RE Sources, or Robson speaking for herself, of anything indicating a desire for the deindustrialization of Cherry Point. What is spoken during the three minute time allotments for comments at the hearing by the parties who are relegated to positions as anti-industry advocates by NWJA, provides important context to their statements indicating concern over the health and safety of our land, air, water, cultural resources and living beings in Whatcom County and a desire for a transition to sustainable energy jobs that do not pollute or threaten the welfare of the region and its people. Who doesn’t want that? And what would be the motivation for not wanting that? What was made clear by industry workers that showed up at the hearing was that health and safety were important to them too. Watch the whole hearing and see for yourself.